Previously, our Jorge reviewed Yonder. 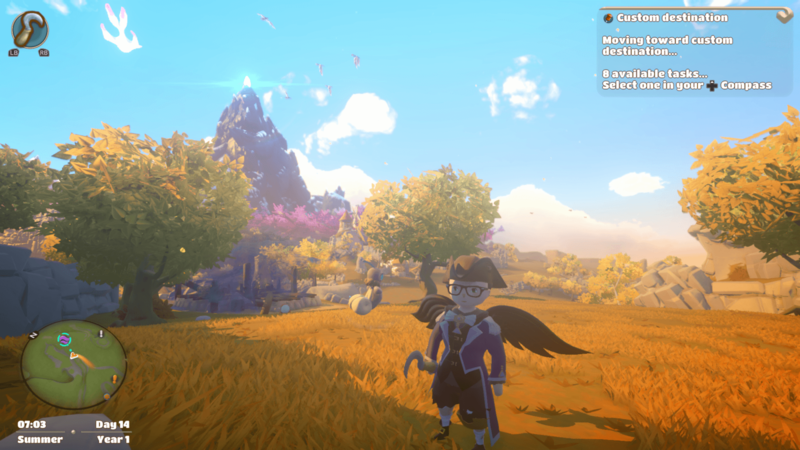 Yonder: The Cloud Catcher Chronicles begins the game with you custom designing your doll-like character. There is a male and female toggle — which basically alters your hair style — plus body shape/size sliders and color options for your eyes and hair. It’s a nice feature to have, as the rest of the game you will be spending time helping others as well as finding clothes and accessories to deck out your custom character with. After becoming shipwrecked on a remote island, you find yourself face to face with a mysterious glowing, cat-like creature named Aaerie. She assures that the other passengers on your ship are safe and transports you into a cave, where you meet the first of many ‘sprites’ — this one being named Lumie. As you exit the cave, you are given a breathtaking view of a grassy open field and a colossal mountain in the distance. Finally, after a hand-holding segment involving Lumie that requires you to follow some basic instructions in order to understand how the game’s quest and tool mechanics work, the island of Gemea is yours to explore. What a beautiful island it is, too! Throughout the many different zones — or biomes, if you want to follow a popular naming convention — you will find plenty of different climates ranging from desert to a snowy mountaintop. Each is wonderfully rendered, with detailed textures that follow the whimsical style of the game but give a grounded sense of established areas for you to find and explore. Another addition to these varied landscapes is the experience of the day and night cycle and the various weather patterns. Your lantern, which is something that your character will automatically brandish at night, gives illumination to a hidden world of shadows and fireflies that makes exploration a bit more challenging. It also showcases one of the most visually impressive elements of the game: a constellation-riddled sky, full of brilliant stars and streaking meteorites. Also, if you look over to the mountain — which can be seen from any part of the island except on it, of course — you’ll find a magical glowing goldfish encircling it, further adding to the subtle magical nature of this land. Nearly all the quests in the game after a certain point will require use of one of the most unique systems in the game: the crafting system. You can retrieve elements required for crafting from the world itself, be it gathering grass or picking flowers or even by smashing rocks, cutting down trees and using your pickaxe to withdraw gems from mineral deposits jutting out of rock walls. Each of the crafted items also requires a particular set of mastery in each of the eight different types of crafting types. To unlock additional items, you must find the master of that craft and showcase your abilities by following their quest. It’s a great system that keeps you always looking out for items and materials as you adventure about and makes you appreciate the foliage-littered landscapes even more so. Yonder takes a gorgeous yet simple art style and runs with it, bringing to mind the high-quality textures and stylings of The Legend of Zelda: The Wind Waker and showcases its broad island with a painterly touch. Each character, object and animal has a polish and sheen that makes the entire island feel alive and makes exploring it to finish quests and find hidden treasure chests that more exciting. You can play the game as broad or as confined as you want to — taking on as many or few quests as you desire. You can even completely ignore the farming aspects of the game, which is vast if you want to dive into it or almost entirely avoidable if you just want to do your own thing. It’s nice to see a game that avoids combat to offer a more simplistic approach to the action adventure, and so expertly crafts a world that is just begging to explore. Yonder: The Cloud Catcher Chronicles is available for the Playstation 4, Xbox One, the Nintendo Switch and on Steam. Check out their website or Twitter for more information.